LOVE The manga and The anime should be just as amazing and cute! The little love stories are just too cute! 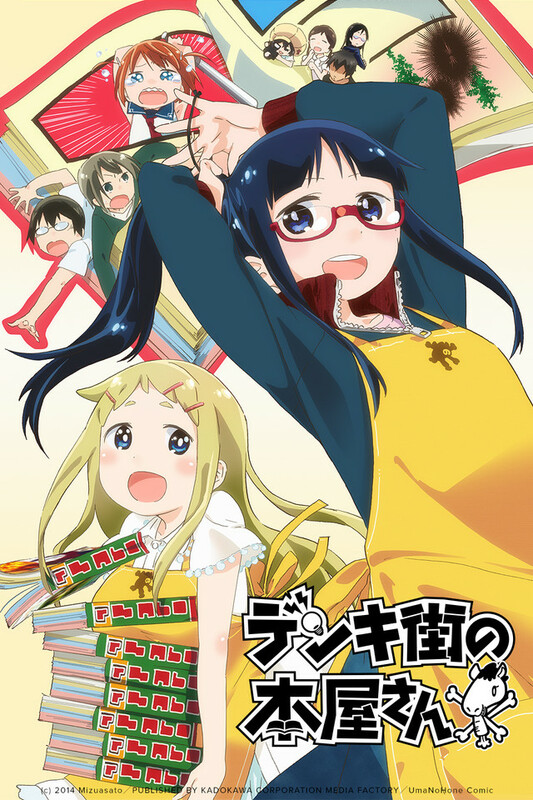 Everyone has different personalities and they all come together to work at the Horse's Bone (Rotten Girl, Sensei, Camera, Sommelier, Director, Hiotan, and recently joined by Umio. ). I enjoy watching them suffer and power through many challenges and event's they encounter. Some heartbreak. But the rest is all cute and comical. Get Ready for Some Hysterical LAUGHTER! The blond girl looks clumsy and always making things complicated inside the store, We'll see what kind trouble the characters will be. the girls with the glasses looks interesting! Well this is another one of those shows like COMIC PARTY etc (I almost wrote COMIC PASTRY but that would be a different show), So if you like this sort of thing you've already seen all the other shows that are just like it, and if you are some kinda neo this is a reasonably good specimen of this kind of show. Silly fun, nice artwork. I've only seen Ep. 1 at this point but so far so good. Thumbs up. A series based around a bookshop. If you weren't aware of the idiocy the real people these characters are based on have to go through, you'll find out in the very first episode, complete with smug, obnoxious, yet naturally fetishised government thug. It's pretty sad this can even be called a comedy, when it's not really that funny...and as you watch more and more of it, it becomes profoundly depressing: these people don't lead very fulfilling or happy lives and are in danger of working themselves to death, being mistreated by the same everyday villains as the aforementioned thug. At least it exposes some of the stupid, the bad, and the disappointing about even the often-glamourised world of manga and manga shops, which often isn't even clear to Japanese natives. But that doesn't really make it funny, and it certainly doesn't make it entertaining, especially if the viewer has worked in this field or even connected to the field. It's just a frustrating reminder of bureaucratic idiocy, unfulfilling work, and a life that could have been so much more. My vote is: avoid it, unless you're looking for an enlightening and sad informational chronicle. It's certainly not a comedy.